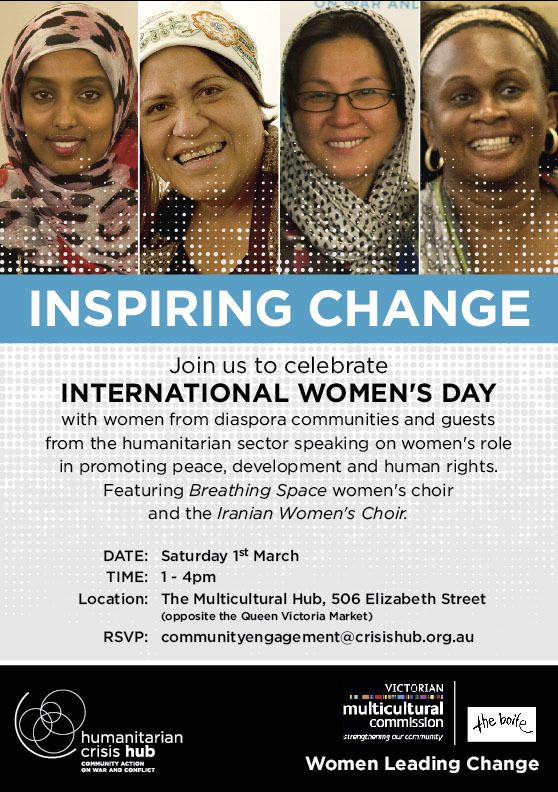 You are invited to Humanitarian Crisis Hub’s International Women’s Day celebration events, as part of our Women Leading Change program. In both Melbourne and Sydney, we will be bringing together diaspora women and their organisations to talk on the contribution that women make to building peace, human rights and development in their countries of origin, particularly countries affected by war and conflict. We will be celebrating International Women’s Day under the theme of Inspiring Change. We would very much welcome your participation and contribution, so please do come along and enjoy the afternoon with us. It will be a chance to hear more about what diaspora women activists and organisations are doing from Australia and how they can be better supported by aid agencies, civil society and government in their work. Featuring presentations from diaspora women’s organisations, discussion panels, guests from the humanitarian sector and the chance to meet with women’s organisations. Featuring speakers from women’s organisations, invited guests from the humanitarian sector, discussion, and performances by the Boite’s Iranian Women’s Choir and the Breathing Space women’s choir. In Victoria, this event is proudly supported by the Victorian Multicultural Commission. Our Women Leading Change network seeks to support women from diaspora communities who are campaigning for human rights and peace in their communities in Australia and in their country of origin. We support them with advocacy strategy development, how to engage the media, organisational development and networking opportunities to link in with the government and humanitarian sector. The Humanitarian Crisis Hub works in Australia with people from countries affected by war and conflict who promote the human rights of people in their countries of origin. We support diaspora community initiatives; provide resources, information and training; facilitate dialogue and shared learning; build networks; and seek to amplify community voices at local, national and international levels. This entry was posted in Events, International Development, Melbourne, Sydney on February 25, 2014 by developmentcircle.